Armagnac is a grape brandy from the Gascony region of southwestern France. Its closest relative is Cognac, another grape brandy from an appellation located about 100 miles north of Armagnac. Even though it is related to and often confused with Cognac, Armagnac is very different with regards to its grapes, terroir, distillation, élevage, blending, aromas, tastes and textures. In truth, France's two finest brandies made from wine are not very much alike at all. Armagnac pre-dates Cognac by about 150 years but never achieved the widespread sales figures that its relatives in the Charente obtained. In contrast to commercial sales, however, the independent producer of Armagnac has always commanded a more important restaurant presence and level of connoisseur appreciation. Let's look at the steps that are necessary to create France's most natural and complex brandy. Armagnac is made from distilled wine, and grapes are the first factor that gives it an original personality. While these grapes ultimately give different aromas and flavors, they more importantly offer different weights and textures on the palate. 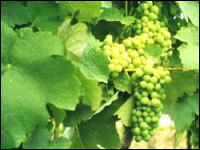 In pre-phylloxera days, the staple grape for armagnac was the Folle Blanche. Its light-to-medium-bodied wine is low in alcohol (7%-9%) and high in acidity, making it less than ideal at the table but perfect for distillation into fine brandy. Armagnacs made from high percentages of Folle Blanche offer seductive characteristics. They tend to be feminine and show especially well in their first fifteen years of life. They normally have a very fine texture and light, high-pitched aromatics (including budding vine flowers, white peach, dried apricot and orange peel). Unfortunately, the precocious Folle Blanche (known as Gros Plant in the Loire) gives low yields, is prone to mildew and rot and today comprises less than 3% of total vineyard plantings. Folle Blanche can perhaps be viewed as the soprano of Armagnac grapes. 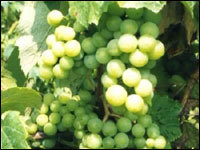 Known as Trebbiano in Italy, Ugni Blanc is most famous in the Charente where it comprises 98% of the Cognac vineyards. Ugni Blanc is relatively easy to grow and gives high yields — in short, a big producer and wonderful investment for growers. This grape produces wines with elevated levels of acidity and low alcohol, yet is fairly neutral in taste. 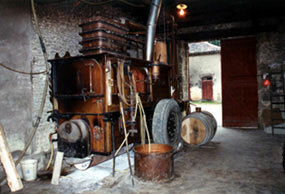 Ugni Blanc now comprises about 55% of the grapes used for the distillation of Armagnac. At their best, Armagnacs made with Ugni Blanc contain pleasing floral aromatics that tend to accentuate the spice notes from the oak in which they are aged. They are less powerful and less flamboyant than Bacco and, in comparison with Folle Blanche, less aromatic and less fine. The alto of Armagnac grapes. After distillation, Colombard's youthful aroma is slightly herbal and reminiscent of freshly mown hay. It never seems to develop the round flavors of Bacco or the delicate floral notes of Folle Blanche, nor does it provide the neutral foundation of Ugni Blanc. While the tenor is especially renowned in the opera world, it is not in Armagnac. Most of the Colombard now makes its way into the region's delightful Côtes de Gascogne wines. Bacco 22-A is a hybrid between Folle Blanche (a grape of the vinifera family) and Noah, a labrusca grape. It was developed after the phylloxera and was very resistant to rot and mildew. It dominated the Armagnac vineyards between its invention in the 1920s and the 1970s, and most Armagnacs on the market from that period are made with an overwhelming percentage of Bacco (occasionally spelled Baco). The end of Bacco is imminent, however, as the AOC board has decided hybrids will no longer be allowed within AOC regions after 2010. Obviously the bass, Bacco delivers an Armagnac that is full-bodied, with plenty of fat and volume. With some age, it expresses itself with jammy dried plum notes, yet it can be somewhat rustic and lack finesse. The Bas-Armagnac (lower-Armagnac) is named for its lower altitude, rather than lower quality. The highest number of quality-oriented producers is located in the northwestern portion of the Bas-Armagnac, specifically in the département of Les Landes. This region, unofficially known as the Grand Bas-Armagnac, has sand-based soil, often with a high iron content (sables fauves) or with small pieces of clay (boulbènes) that tend to yield spirits that are very supple in their youth. The Bas-Armagnac is dominated by Bacco and Ugni Blanc plantings. 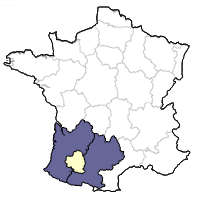 While several excellent independent producers exist in the Ténarèze, this central region is home to most of Armagnac's négociants. The soil base in the Ténarèze is harder (clay and limestone) giving spirits that are firmer in their youth. Spirits from the Ténarèze, however, generally have the ability to age longer than those from the Bas-Armagnac. Plantings are dominated by Ugni Blanc and Colombard, and many farmers divert a good portion of their crop into excellent Côtes de Gascogne wines or Floc de Gascogne, the region's equivalent of Pineau des Charentes. For the distillation of Armagnac, the main objective is to heat wine until it boils, purely condense its vapors, and finally reconvert this steam into liquid form again. Traditional Armagnac is distilled once in a small continuous still called an alambic, which is often transported from one producer to the next between the months of November and January. Unlike a double-distillation pot still that eventually heats wine to around 72% (144 proof), the Armagnac alambic issues a spirit between 52% and 60% (104 and 120 proof). First, the wine enters the fire-driven alambic and is warmed in a pre-heater. From there it passes into the main column where it cascades over a number of heated plates. When the wine reaches the lower boiler, it begins to steam and evaporate. The alcoholic vapors then rise back through the curved tubes within the plates, forcing the outgoing eau-de-vie into contact with the incoming wine and insuring that additional fruit elements and flavors are transferred to the spirit. Finally the vapors exit through the top of the column and into the condensing coil, where they are cooled from steam into liquid form before dripping into a wooden cask. This lower-alcohol spirit retains many esters, acids and congeners that double-distillation purifies or eliminates altogether. In their youth, these non-alcohols can make the spirit thick, rustic and slightly foxy. Given time these elements oxidize and gain tremendous aromatic complexity. One needs, however, at least 12-15 years of patience. Unfortunately, the commercial market demands products that are young and inexpensive. Therefore, the blends of many négociants (3 Etoiles, VSOP, Réserve, Hors d'âge) incorporate a percentage of double-distillation (reinstated in 1974) which permits the removal of the non-alcohols and ultimately yields a lighter, more neutral and consumer-friendly spirit that can hit the market after only several years. Armagnac is traditionally aged in a 400-420 liter oak cask known as an une pièce armagnacaise. Whereas Gascon oak was once commonly used, lack of natural resources now warrants an increased usage of oak from the Limousin forest. The differences between the two types of oak are not tremendous: Gascon oak tends to give more tannin, Limousin more vanilla. Adjusting time levels in newer and second-use oak can compensate for each barrel's physical differences. Blended Armagnacs can be a mixture of various vintages, various properties, various sub-regions and various distillation types. They are very frequently adjusted in one way or another by an enologist to promote color and taste consistency. As with Cognac, the goal is to standardize releases so that a VSOP or XO released in 1993 tastes the same as a VSOP or XO released in 1998. Enologists often make their presence felt during three important phases of a blended Armagnac's life. The first is during the fermentation of wine when certain scientific measures are necessary to create a correct, healthy base material for distillation. 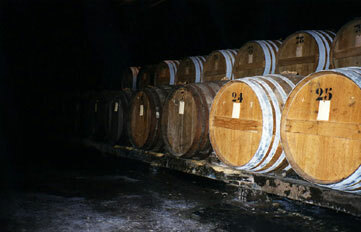 The second is during the élevage when a producer desires advice on things like barrel rotation or racking — strategies that can accelerate the oxidation process. The third — during the blend or coup — is when the skills of an enologist are utilized the most. Ideally, the enologist's influence on the final spirit is minimal; he combines various barrels and comes up with a completely natural blend. Realistically, the enologist plays a role that includes plenty of intervention. 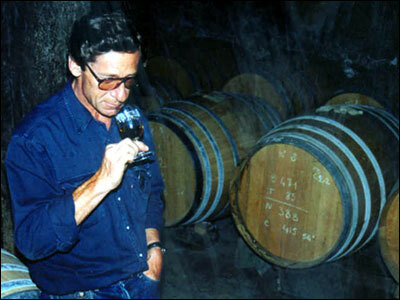 During this time, the enologist normally uses his stable of permitted additives to correct or rectify a blend. Within Armagnac, like Cognac blending, there are four groups of permitted additives, each with a different role. Water is the most natural additive, normally used to cut excessive alcohol or heat (essential for double-distilled products). It can also be used for more insidious purposes, like increasing the amount of spirit to sell or lower duties and taxes. Enthusiasts should make a habit of looking at the alcohol level of vintage Armagnacs. Whereas 80 proof is the normal for the final strength of most Cognacs, the character of single-distilled Armagnacs are tremendously altered through reduction. Why? Reducing a double-distilled product which is devoid of the majority of esters and congeners is like diluting a perfume so that it becomes akin to eau de toilette or producing a wine made with a harvest of 100 hl/ha instead of the normal 50 hl/ha. Single-distilled Armagnacs, instead of just becoming thinner, take on a more forceful character — rustic, foxy even. Their natural texture and balance of flavorants is thrown completely out of balance. Understandably, reduction is a bad word to the armagnac traditionalist. Boisé is a second permitted additive, created by boiling wood chips in water, then removing the chips and slowly reducing the remaining liquid. What one is left with is a dark brown liquid that is replete with wood flavor and tannin. The reason for using boisé is simple. It basically gives the impression of oak aging to a final spirit. An aged boisé is also available to the enologist. It is less bitter than straight boisé, and offers secondary wood aromas like vanilla and grilled nuts, giving an impression of age to a spirit. Sugar syrup is the third adjustment tool that is used to add sweetness to Armagnac. It's normally added if the Armagnac is too tannic, or to remove any rough edges it might contain. This viscous additive may be either be dark or light. Legally, 2% of an Armagnac's content can be sugar syrup. A final shortcut is caramel. This is a liquid made from burned sugar. Caramel is dark in color and slightly bitter in taste. It is not used to sweeten Armagnac, but to adjust its color and establish consistency or give the spirit the impression of being older and therefore smoother. 3 Étoiles (3 stars), which must be at least two years old. VSOP or Réserve, which must be five years old. Napoléon, Vieille Réserve or XO, which must be six years old. Hors d'âge, which must be 10 years old. Occasionally these blends contain Armagnacs that are older than the minimums, but they do not normally vary from their requirements by more than a few years. Vintage Armagnacs can usually be found in upscale wine stores and restaurants. They must come entirely from the vintage listed on the label. As Armagnac matures only in cask and not after being bottled, vintages must also state the bottling date on the front or back label. In this way, one is generally assured of the spirit's exact age. What many people do not realize is that a lot of the older vintages have been in glass demi-johns for decades and have not evolved since leaving the barrel. Bottling dates must now be put on vintage Armagnacs, yet one cannot assume that the bottling was done directly from barrel: That 1947 Armagnac may have been put in glass in 1975, truly making it a 28-year-old armagnac. Consequently, an Armagnac distilled in 1970 and bottled in 1998 has the same amount of maturity. Independent Armagnac Producer or Négociant? Independent estates will always show the domaine's address on the front label, along with the appellation (Bas-Armagnac, Ténarèze, Haut-Armagnac). If not, chances are the spirit was bottled by a négociant in another part of France, perhaps in the Charente or Paris. Many négociant bottlings have labels that simply read "Armagnac." This is because the spirit inside is a blend of the various sub-regions or because the grapes were grown in one sub-region of Armagnac and distilled in another. Ideally, Armagnac spends enough time in new oak to naturally pick up color, vanilla and spice. Afterwards, in more neutral casks, slow oxidation continues — the alcohol level slowly diminishes while the spirit becomes more viscous and soft, finally reaching a point where there is a playful tension between tannin, fruit and alcohol. The Armagnac is bottled directly from cask at its natural strength without any sort of outside intervention and the bottle carries its vintage date. This is true, classic Armagnac that guards the individuality of its base material and natural élevage. Obviously, it is the Armagnac sought by connoisseurs. 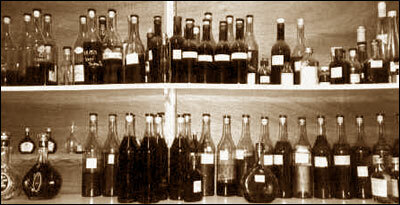 Traditional Armagnac has always had a close relationship with the individuality of the wine world. Vintages are an important element that sets Armagnac apart from Cognac because it is common for Armagnac, unlike its Charentais relative, to be marketed by the year in which its grapes were grown. Vintages, according to those in the Charente, are never perfect and always contain some type of defect. Blending helps correct these defects and allows for a consistent, uniform taste and continuous availability even in very difficult wine years. Yet as there are so many variables that play a role during an Armagnac's life and producers approach their craft differently, it is difficult to make sweeping generalizations about Armagnac vintages as one might with wine vintages. In addition to the quality of wine, one has to consider the quality of distillation, quality of the oak barrels used during the various decades of élevage, and the naturalness of the final bottling. One of the biggest myths among spirit consumers is that something older is automatically better. The fact is that most Armagnacs peak, with regard to their fruit, alcohol and tannin balance, between their 18th and 30th birthdays. It is possible to obtain outstanding Armagnacs distilled 30, 40, or 50 years ago. The majority that have remained in wood this entire time, however, are overly dry and dominated by secondary aromas. Armagnac is a digestif (a spirit that aids digestion) and is traditionally savored after a satisfying meal. This is certainly not the only time that consumers should enjoy an Armagnac, however. Armagnac can be paired with certain desserts — almond cakes, apple tarts, orange and vanilla tarts, nougat and chocolate-based desserts, caramelized pears, fruit salads or plums macerated in Armagnac to name a few. A glass of Armagnac also provides a great accompaniment to coffee and cigars (mild cigars matched with Armagnacs that have plenty of fruit and viscosity). Armagnac is a live spirit that reacts to oxygen, but much less so than wine. If one puts the top on the bottle after pouring, there should not be a noticeable difference in the Armagnac's taste as time goes by. When half the bottle is gone, purists may transfer the other half to a smaller bottle. This reduces the amount of air contact with the spirit. Traditionally a snifter is used to taste Armagnac. Smaller, more tapered glasses, however, help focus Armagnac's aromas better than many balloon glasses. Specific glasses have been designed which help concentrate an Armagnac's flavors, including Riedel's spirits or brandy glasses. Thin glass is extremely important in heightening aromatics. Thick-glass snifters belong on thrift store shelves rather than in the hands of connoisseurs. Warming the glass in one's hand is pleasurable yet causes the alcohol aromas to surface before those of the fruit. Consequently, one normally holds a brandy glass by the base, like one would hold a wine glass. Believe it or not, some people think they should heat the glass with a candle before serving an Armagnac. These people should be reminded of Richard Pryor's mishaps with heated glass! The normal pour for an Armagnac is 1.5 ounces, although one can obviously make an assessment with much less in the glass. Procedure for tasting is much like that with wine. First one observes the color and clarity. Next, the first nose or nose without aeration. Remember, Armagnac has much more alcohol than wine. One has to play with the angle of the nose to the glass to find the spot where the fruit aromas surface over those of alcohol. Then comes the second nose or the nose with aeration. Next one tastes: perhaps a few drops on the palate to begin, then a small sip. This may be gently rolled around the palate for several seconds, then either spit or swallowed. One should then judge the finish and length. From late-teenage years until the late-twenties, Armagnacs are normally in their prime. One should be always be looking for a playful tension between the fruit (sweetness), alcohol and wood (tannin). If there is too much fruit, it becomes overly reminiscent of a liqueur. Too much alcohol masks the fruit. Too much oak just dries out the palate. The Armagnac should display finesse (the most possible flavorants enveloped within the most delicate texture) on the palate. Like with wine, one should seek subtle, defined nuances in lieu of monolithic flavors. Rancio notes should never dominate the fruit. Instead, there these secondary notes should ideally dance along the surface of the fruit.